November 20 2015. 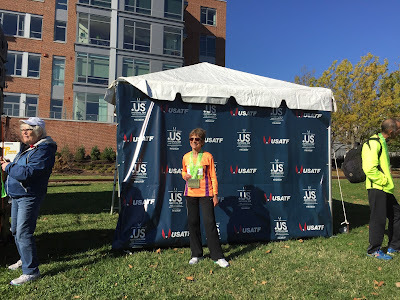 Fall is a great time for a 12K race. The weather on Sunday, November 15th was crisp and cool in the morning, warming up to upper 50's,/low 60's by afternoon. The race started at 7:55 am with very little wind or humidity and temps in the low 40's. 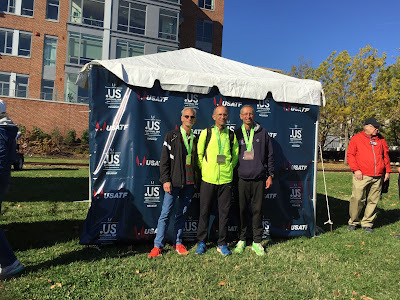 We were running though Oldtown in Alexandria Virginia, just south of the Nation’s capital, and then onto the George Washington parkway running south along the Potomac. The course is pretty fast, a true 'out and back' with only 1 real uphill on the way out, and it is not long, even shorter on the way back. 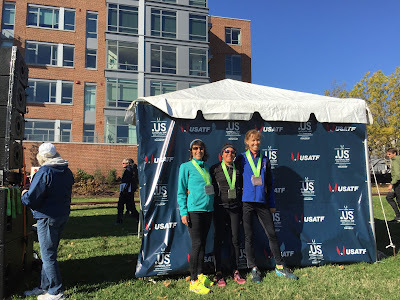 Apart from that the runners have a long straight at the start and finish of about 3/4ths of a mile, and a 2.5 mile long flat stretch along the George Washington (GW) Parkway to the turn-around. 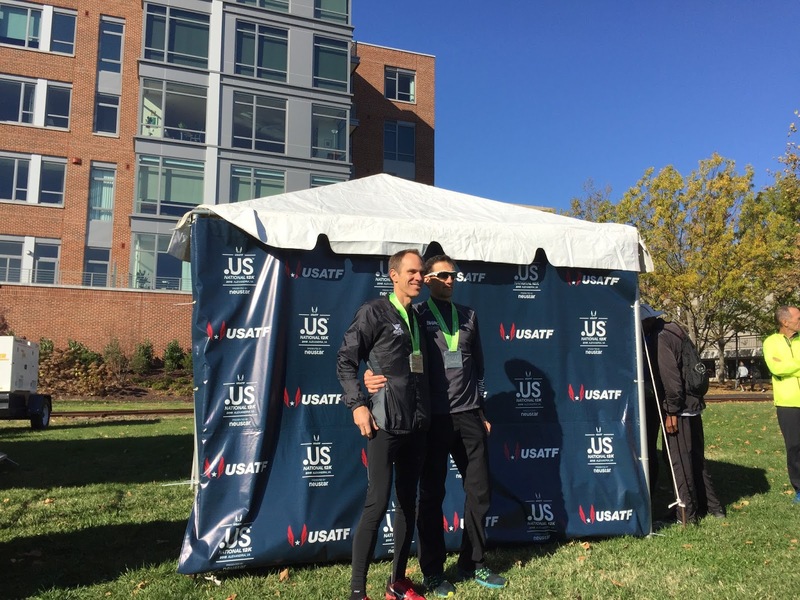 Two Masters runners took advantage of the day to set records, and a third athlete came very, very close. RECORDS. Jen Rhines, now in her 41st year, had indicated her intention to try for a top 10 finish in the Women's Open Elite race. She felt it would take a faster time than her record setting effort last year to do so and she was right. 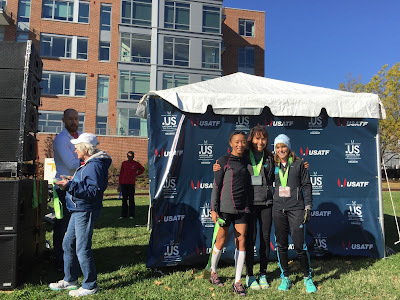 That goal enabled her to run faster than last year and establish a new Masters 12K record for women of 42:04, lowering her old record time by nearly half a minute. It’s a tribute to training and resilience when you’re getting faster with age! An age group record was also set. 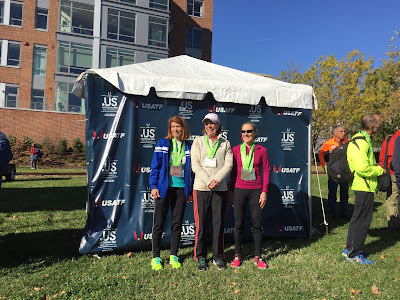 Edie Stevenson broke the 2005 Women's 65-69 record of Barbara Miller, 55:15. Stevenson not only broke it, she trampled it, running 53:46 to break the record by nearly a minute and a half. What an achievement! AGE-GRADING CHAMPIONS. Not surprisingly Kathryn 'Kathy' Martin, 64, stood atop the age-grading standings with another effort over 100%, the only one to even approach 100% in this race. Her time translated to a 100.41% age-grade score. The other top age-grading scores for women were turned in by Edi Stevenson [94.85], Perry Shoemaker (92.19), Carmen Ayala-Troncoso (90.78), and Heide Moebius (90.36). Tom Bernhard led the way on the men's side with a 92.69%. As usual the top women's age-grading exceeded that of the men but the men were more tightly packed. Rick Becker was a half percentage point back in 2nd (92.14), followed by Kristian Blaich (91.26) and a tie between Lloyd Hansen and Doug Bell, both at 90.22. OVERALL MASTERS WINNERS. This is one of the USATF races that awards a prize to the top 3 overall Masters winners, the first three in the Masters category to cross the finish line. The Women had a repeat winner as Perry Shoemaker took her 3rd consecutive title in 42:04. So far she is the only overall Masters 12K winner, the women's side of the competition has known. The race has been run since 2013 and she has won every time. Friend-Uhl hung tight with Shoemaker as they hit the first mile together in 5:38. But then Shoemaker gradually pulled away, opening a gap of 6 seconds by the 5K which ballooned to 42 seconds by the 8K mark. After that it was all Shoemaker but Friend-Uhl kept it together to finish off a very fine run in 43:23. At the same time Brenda Hodge was locked in her own battle with Melissa Senall for the 3rd spot on the overall podium and the cash prize that goes with it. Senall completed the first mile in 6:14, with a 5 second gap on Hodge. By the 5K mark, Hodge had caught and passed Senall to lead by 2 seconds.But by the 8K mark it was Senall in front again, by 3 seconds, in 31:01. What a struggle! Neither the positions nor the gap changed over the next 2 kilometers. Now it would come down to whoever had the most left as they turned the corner, raced up a little hill and then down on to the finishing straight of 1300 yards.In the end it was no contest; Senall could not match Hodge's finishing burst as she pulled away to gain third place by 18 seconds in 46:35. In contrast the Men's side has seen a different overall winner each year. The defending champion, Michael Wardian, had two formidable challengers including the hard charging runner from the Atlanta Track Club, Kristian Blaich, and the runner Blaich beat at the USATF 5K championships in Syracuse, Philippe Rolly. Blaich went right to the front with Rolly on his shoulder as they went through the mile in 5:23 with a chase pack consisting of Wardian, Jonathan Frieder and Thomas Carroll about 6 seconds back. By the 5K mark it was clear this would probably not be Wardian's year. Blaich and Rolly crossed the timing mat together in 16:32 and had a 20 second gap on Frieder in 3rd and a half minute over Wardian. By the 8K Blaich had finally forged a small gap, 2 seconds, over Rolly with Frieder now over 45 seconds back and Wardian another ten seconds behind him.From there forward Blaich built on the lead, raising it to ten seconds by the 10K mark and defeating Rolly 39:29 to 39:48. Wardian moved past Frieder between the 8K and 10K marks and took a strong third place in 40:40. Frieder pushed home in 40:59, holding off a fast closing Carroll who finished 5th overall in 41:21. 40-44. (Covered above in 'Overall') Shoemaker 42:04, Friend-Uhl 43:23, Hodge 46:35. 45-49. As expected, Cassandra Henkiel visited from Austin TX, hit the 5K mark in 19:39 with a 90 second lead, built it from there and got the win and another 100 points in the Individual Grand Prix race; her time was 47:37. 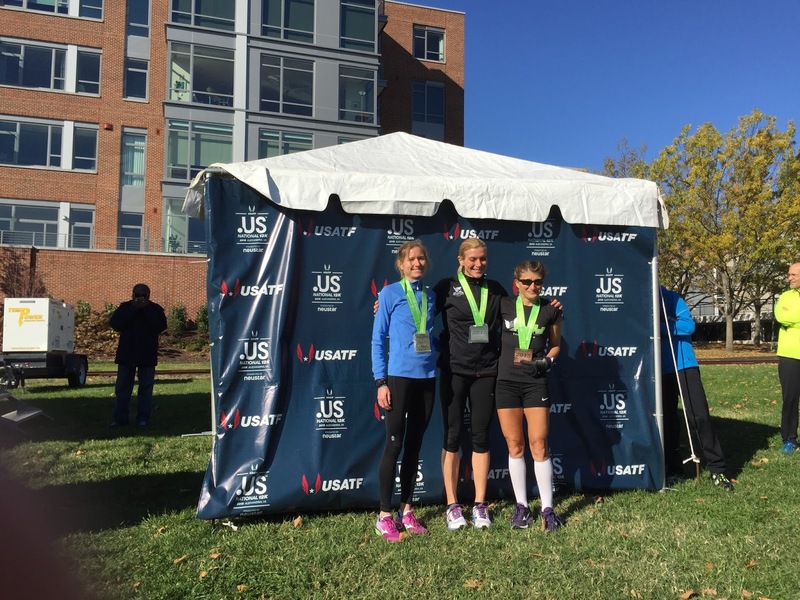 Audra Naujokas-Knapp took 2nd in 51:33 and Shannon Smith took 3rd in 53:49. Henkiel 47:37, Naujokas-Knapp 51:33, Smith 53:49. 50-54. 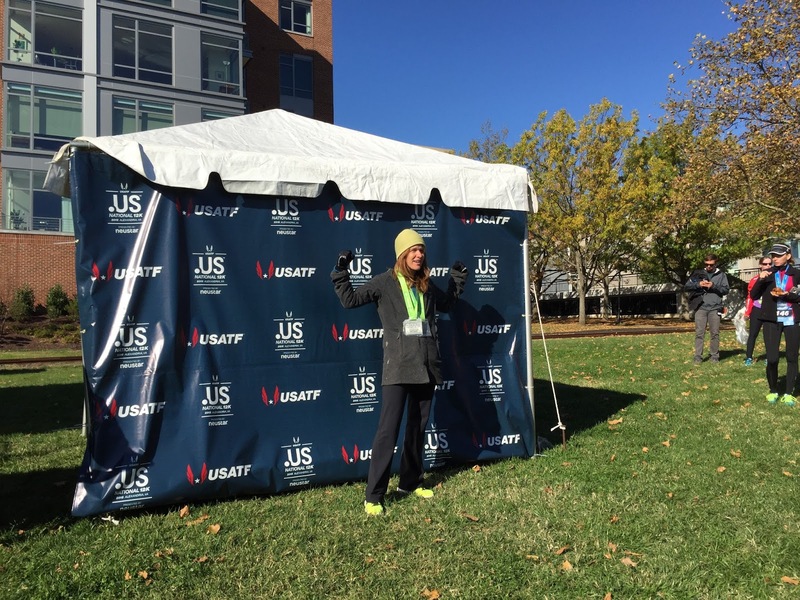 The defending champion, Alisa Harvey, showed she is still the one to beat in this age group. She crossed the 5K mat in 19:35 with a 1 minute lead, and built the lead steadily up, finishing in 47:26 for a final margin of over 3 minutes. Lorraine Jasper ran a strong, steady race to claim 2nd in 50:45. The third spot in the group saw a competitive race. Carol Bischoff went out in 6:56 to establish a ten second lead over Julie Pangburn at the mile marker. But then Pangburn started to gradually close, pulling to within 2 seconds at the 5K mat, which Bischoff crossed in 21:49. Pangburn made her move over the next 3K to take the lead at the 8K mark, 34:48 to 35:09. It was all Pangburn the rest of the way as she took 3rd in 52:20, with Bischoff just off of the podium, thirty seconds back. Harvey 47:6, Jasper 50:45, Pangburn 52:20. 55-59. When there is a Hall-of-Famer like Carmen Ayala-Troncoso in the field, the race is not likely to be close. Ayala-Troncoso hit the 5K mark in 20:31 with a two minute lead and never looked back. In the end she had more than a 5 minute margin, finishing in 49:04. There was a much closer race for 2nd and 3rd. Julie Hayden, Ida Draim and Colleen Magnussen all covered the first mile in about 7:30. But things were starting to settle out by the time the trio hit the 5K mark. Hayden hit it in 22:49, with Draim 23 seconds behind and Magnussen another 13 seconds back. Those gaps all grew over the final 7K, with Hayden claiming 2nd in 54:33 and Draim 3rd in 56:14. Bischoff was a minute off her pace to finish just off the podium in 4th. Ayala-Troncoso 49:04, Hayden 54:33, Draim 56:14. 60-64. As usual, Hall-of-Famer and many time Runner of the Year, Kathy Martin was atop this group even though it is her last year to grace it. In fall of 2016 she moves up. She is definitely going out of the age group in style. Martin crossed the 5K mat in 20:35 with a 90 second lead over the very strong Greater Boston runner, Elizabeth Cooney. By the end Martin had run the 12K in 49:25 and had more than a 3 minute margin. Cooney took care of business, running the 2nd 5K faster than her first. By the finish she also had a margin over her closest competitor, New York's Coreen Steinbach, who took 3rd in 55:58. The other strong Empire State runner, Sharon Moore kept the pressure on the whole way but was never able to pull even, finishing 14 seconds back of Steinbach in 4th.Martin 49:25, Cooney 52:44, Steinbach 55:58. 65-69. 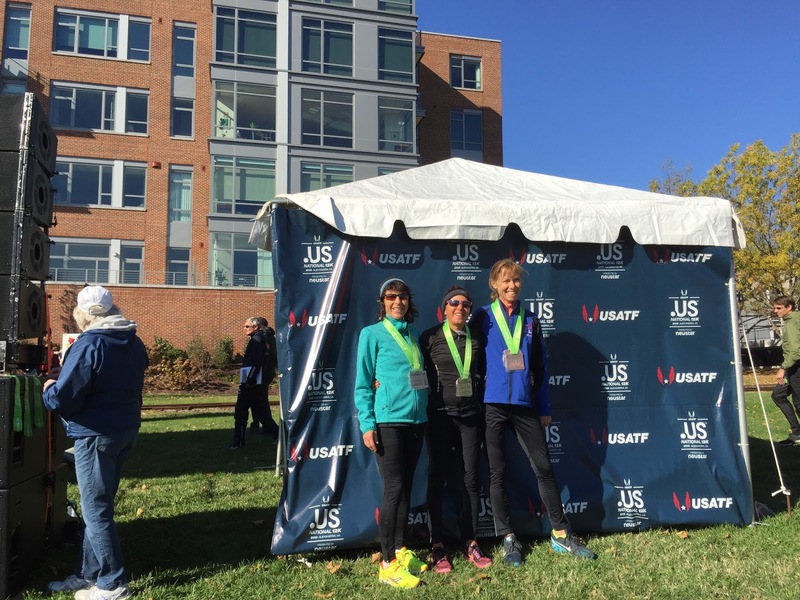 Edie Stevenson made my prediction for a record in this age group come true. 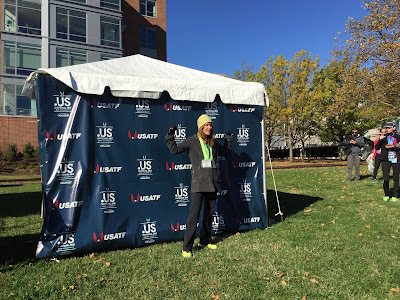 She took on all comers, running a 53:50 (gun) to take the division by 3 minutes. Erika Campbell was 3 minutes back in 2nd with Alice Franks claiming 3rd in 58:44. Stevenson 53:50, Campbell 56:50, Franks 58:44. 75-79. The celebrated runner, Heide Moebius, won this age group race in 1:07:20 and, as a bonus, was in the top 5 age-grading runners. 40-44. The competition between Philippe Rolly, Michael Wardian, and Thomas Carroll was detailed in the report on the overall competition above. Rolly 39:48, Wardian 40:40, Carroll 41:22. 45-49. The overall winner, Kristian Blaich, took this group as his swan song in the M45 12 K championship. Next year he will be in the 50-54 group. Jonathan Frieder was in contention for third place overall through the 10K mark. He fell off from that pace but maintained a lead over Doug Mock to take third in the age group. Blaich 39:29, Frieder 40:59, Mock 41:26. 50-54. This was one of two groups on the men's side to be settled by less than ten seconds. Francis Burdett ran with the lead group for the first mile, crossing the mat in 5:32, establishing a 9 second lead over Steve Kartalia. When Burdett passed the 5K mark in 17:12, he had built a 16 second gap. It took Kartalia the next 3K to whittle the lead back down to 9 seconds. By the 10K mark, which Burdett hit in 34:47, Kartalia was only 3 seconds back. Kartalia pulled even and was able to power past Burdett and hold it to the finish in 41:32 with Burdett 7 seconds back -- a terrific race! In the meantime, the two Genesee Valley Harrier teammates, Alan Evans and Mike Nier were locked in a real duel with the two Playmakers Elite runners, Eric Stuber and Ruben Henderson, for third place. Henderson passed the mile clock in 5:29 with Nier 4 seconds back and Evans and Stuber another 7 seconds behind. By the 5K mat, Nier had edged ahead of Henderson by 2 seconds in 17:18, with Evans and Stuber still 7 seconds further back. The next 3K saw one big change; Evans moved past Henderson to run within 2 seconds of Nier's leading 27:50, followed by Stuber, with Henderson now 9 seconds back of Evans. Nier went through 10K in 34:53 with Evans right on his shoulder; Stuber was 10 seconds back and Henderson falling back. Evans had saved enough to kick away from Nier on the final straight to take 3rd place by 4 seconds in 41:47. Kartalia 41:32, Burdett 41:39, Evans 41:47. 55-59. Compared to the 50-54 group, this one was almost a cakewalk for Dave Bussard. Bussard hit the 5K in 17:27 with a half minute lead and was never headed, winning the group in 42:29. It was a real treat to see Jeff Dundas back in contention after some health issues had made training rather difficult. Tom Dever went out a little faster than Dundas with a 5:44 first mile and a 3 second gap. By 5K Dever had built the gap to ten seconds, hitting it in 17:49. (Are these guys really in their late 50's? Amazing!). Dundas turned on the jets over the next 3K to reverse the order, hitting the 8K mark in 28:42, twelve seconds ahead of Dever. Dundas was able to extend the gap over the final 4K, finishing in 2nd in 43:12 to Dever's 43:40 in third place. Just like the M50, this was a tough group. Just off the podium was Antonio Arreola 20 seconds back of Dever and Ken Youngers recovering from a hamstring another 40 seconds back. Bussard 17:27, Dundas 43:12, Dever 43:40. 65-69. Lloyd Hansen ran away with this and came within a whisker of breaking the American record! Hansen ran his first mile in 6:10 and did not slow down much as he hit the 5K mark in 19:32. Hansen maintained a steady 6:20 to 6:21 pace through the 8K mark but then slowed slightly between 8K and 10K which he ran at 6:24 pace. But that slowing may have had a big payoff as he was fresh enough to run his last 2K at 6:15 pace. In the end he clocked 47:03 (gun time) to miss the 46:58 record (net time) by only a second or two. Although Hansen missed the age group record he did at least, set a PR. 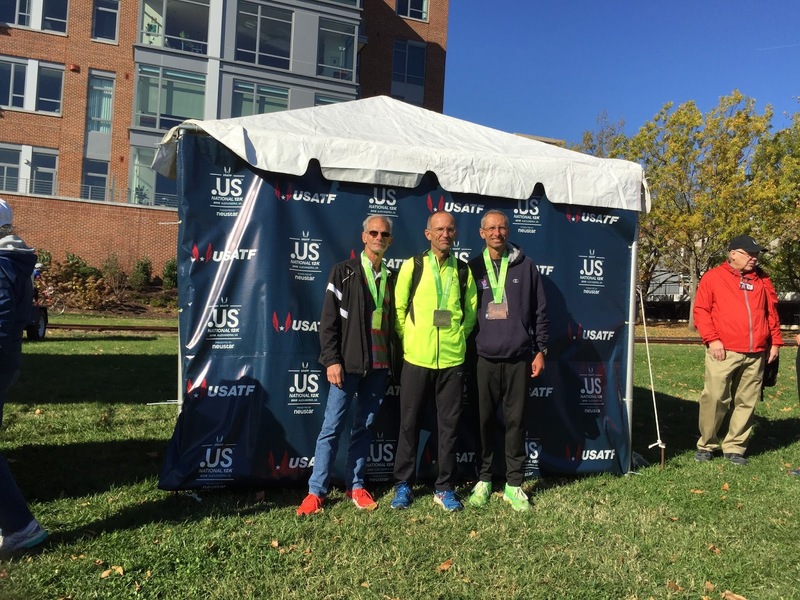 This is the 9th year in a row that Hansen, age 67, has run at least one PR-amazing! Tony Gingello took 2nd by a fairly comfortable margin in 52:14. 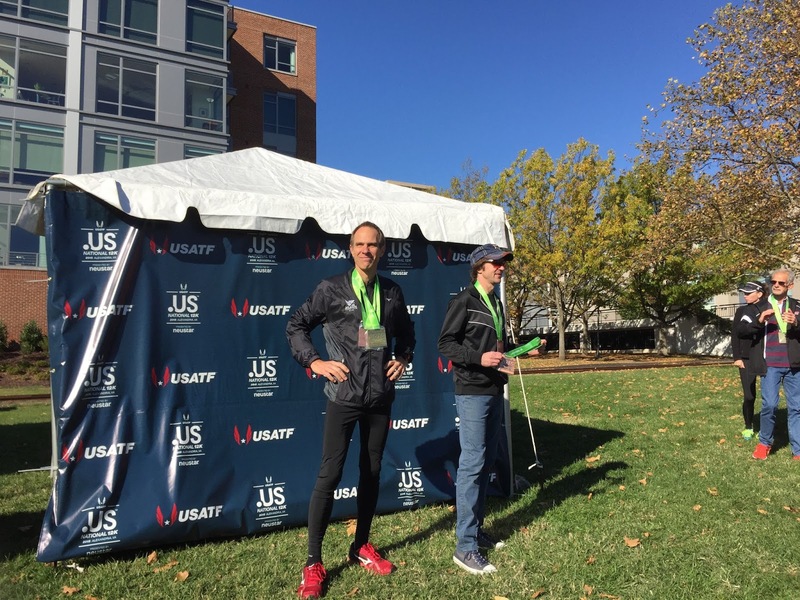 Jerry Learned, the consistent and reliable distance runner for the Atlanta Track Club, was a half minute back in 3rd place. Hansen 47:03, Gingello 52:14, Learned 52:47. 70-74. This was the second consecutive race in which Przemyslaw Nowicki and Paul Carlin (yours truly) battled for the victory in this age group with the margin of victory less than ten seconds! In a reversal of roles, Carlin went out faster at the start and this time it was Nowicki passing Carlin around the 2 mile mark, just the reverse of what happened in the 15K two weeks earlier. Unlike that race where they exchanged the lead a few times, this time Nowicki passed and held the lead all the way to the finish. Nowicki led Carlin by 13 seconds at the 5K and by 19 seconds at the 10K. Carlin was gaining over the last 2K but could not close fast enough. At the finish line Nowicki enjoyed a wider margin this time, 8 seconds instead of 4, taking the title 52:41 to 52:49. Almost more remarkable was the fact that Doug Goodhue, the 'silver bullet' was behind, not in front of those two. Goodhue is a terrific champion and a feisty competitor. Even though he probably should have skipped the race because of prior damage to his right leg, he wanted to compete and felt an obligation to lead his 70+ Ann Arbor Track Club teammates into battle with the other 70+ teams. He started off gamely, sprinting from the line to lead the group for the first 2 and a half miles or so. Shortly after Nowicki passed Carlin, he went past Goodhue. Goodhue tried to respond but found that he could not. Still, as game as ever, Goodhue persevered and took 3rd overall in 55:08, leading his team into the finish line.Nowicki 52:41, Carlin 52:49, Goodhue 55:08. 75-79. 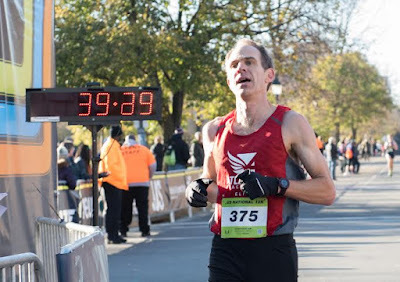 John Elliott took a decisive win in this group, establishing a 17 second lead over Roland Cormier in the first 5K and accelerating his pace from 5K to 8K and, by the end, had built the lead to 2 and a half minutes, 1:00:46 to 1:03:15. Cormier ran a very steady pace in finishing second. Harlan Van Blaricum took 3rd in 1:10:56. Elliott 1:00:46, Cormier 1:03:51, Van Blaricum 1:10:56. 40+. The Genesee Valley Harriers took this division easily with Melissa Senall and Wakenda Tyler taking 1-2 in the team race. Their 3rd runner, Audra Naujokas-Knapp, was 4th in the team race. Their total time of 2:26:55 was good enough for a large margin of victory, about 28 minutes. The TNT International Racing Club, the home team from Washington D.C., took 2nd in a very competitive contest with the Philadelphia Masters team. 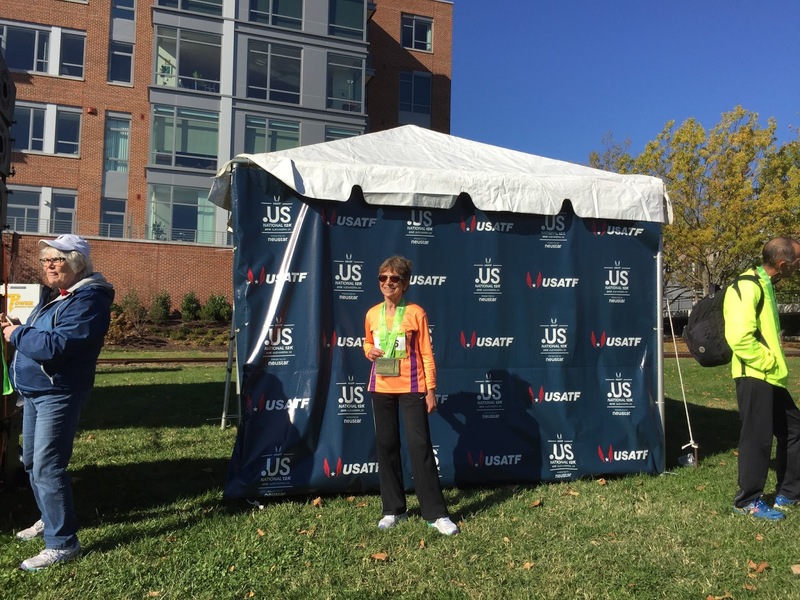 Marilyn Gregory, TNT's top runner, ran nearly ten minutes faster than Philadelphia's top runner, Linda Kelnock. But Philadelphia had a much tighter pack. Philadelphia's 2nd and 3rd runners, Lauren Estilow and Judy Stavely came in before TNT's 2nd and 3rd, Nancy Latsch and Joy Oakey, but would it be enough. In this case, the answer was no as TNT took the 2nd place medal by 2:20 seconds. 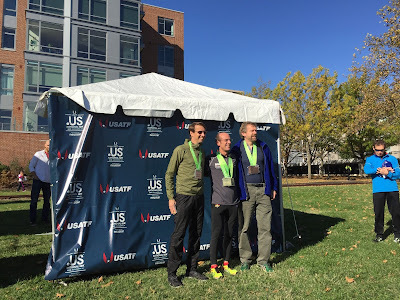 Genesee Valley Harriers 2:26:55 (48:59 avg. 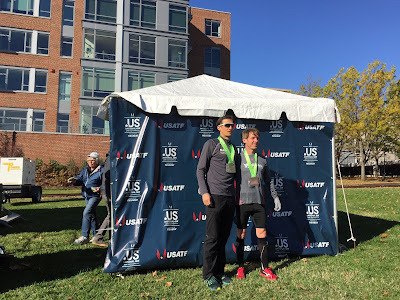 ), TNT International Racing Club 3:04:53 (1:01:38), Philadelphia Masters 3:08:13 (1:02:45). 50+: The biggest question in this division was whether the Athena Track Club's A or B team would win. Needless to say, both hoped to also defeat the Genesee Valley Harriers. First in was Lorraine Jasper for ATC A with more than a minute lead on ATC B's 1st runner, Julie Pangburn. Pangburn, in turn, had a 31 second lead over GVH's 1st runner, Carol Bischoff. Seven seconds later, ATC B's Joan Hunter zipped across the line, to be followed by her B teammate, Betsy Stewart, less than a minute and a half later. That wrapped it up for the ATC B team. Now the unanswered question was whether Athena A could still defeat GVH. In the end, it was a clear cut 2nd place finish for Athena 'A.' Their 2nd runner, Julie Hayden, came in 26 seconds behind Stewart and 3 minutes ahead of GVH's Colleen Magnussen. When the next runner across the line was Athena B's Mary Swan rather than GVH's Jill Gordon, the suspense was over and Athena A had their 2nd place. Athena Track Club B 2:39:05 (53:02). Athena Track Club A 2:42:03 (54:01), Genesee Valley Harriers 2:48:12 (56:04). 60+: The GVH team of Sharon Moore, Belinda O'Brien, Cindy Ingalls and Jeanne Herrick ran unopposed but their total time of 2:53:06 makes ti clear that they would be a fromidable opponent regardless of who showed up to challenge. Genesee Valley Harriers 2:3:06 (57:42). 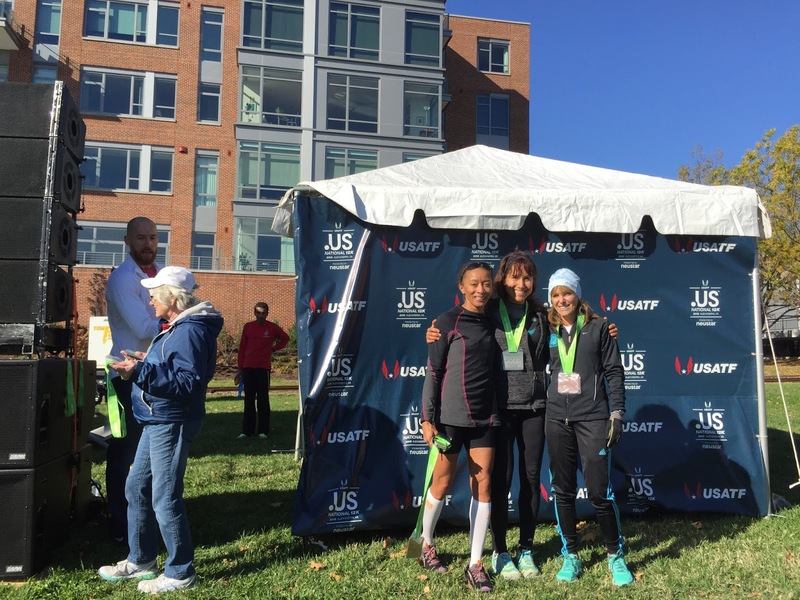 40+: The Baltimore Washington Athletic Club successfully fought off the challenge of the Atlanta Track Club. ATC's top runner, Kristian Blaich, finished 19 seconds ahead of his counterpart, Philippe Rooly, and ATC's 2nd runner in, Thomas Carroll, had 4 seconds advantage over his BWAC counterpart, Doug Mock. But then BWAC's Douglas Wickert came in over a minute ahead of ATC's john Westrick and that was enough to give BWAC a 1:04 victory. The other local team, the TNT International Racing Club took 3rd place. BWAC 2:03:31 (41:11 avg. ), ATC 2:04:35 (41:32), TNT 2:26:59 (49:00). 50+: The Playmakers Elite/New Balance team out of Lansing MI and the Genesee Valley Harriers out of greater Rochester NY, put on a heck of a show for us. GVH's Al Evans and Mike Nier came in 2-3 in the team competition but the next 3 runners across the line, Eric Stuber, Ruben henderson and Dave Bussard, were all from Playmakers. After the first 2 runners were in, GVH was 45 seconds ahead. But by the time GVH's Charlie Andrews came in, Playmakers had reversed that advantage and enjoyed a margin of victor of a minute and a half. And the race for third was even closer. BWAC's Steve Kartalia was 1st in the team race establishing a minute and a half lead over ATC's 1st runner, Jeff Dundas. But ATC;s 2nd runner, Jeff Haertel finished almost that much in front of BWAC's Mark neff. After the first two runners for each team were in, BWAC was 12 seconds ahead. It all came down to the 3rd runner for each team. ATC's Ken Youngers was able to nip BWAC's Jean-Christ Arcaz y 18 seconds. That allowed ATC to claim the 3rd spot on the podium by a whopping 6 seconds! It doesn't get much closer than that. Playmakers 2:06:52 (42:18), GVH 2:08:30 (42:50), ATC 2:11:07 (43:43). 60+: Unlike the first two men's divisions, the Boulder Road Runners won this one by a strong margin. Their 1st, 2nd and 3rd runners all finished ahead of their counterpart on the 2nd place GVH team. John Victoria had over a minute on Mark Rybinski, Doug Bell 2 minutes over Tim McMullen, and Devin Croft 30 seconds over Frank Gioia. The Shore Athletic Club was not quite able to keep up, despite the fact that Reno Stirrat, their top runner, finished 1st in the team competition. But they were able to fend off the powerful Ann Arbor Track Club. Stirrat gave them a 2 minute lead, finishing that far in front of Lloyd Hansen, AATC's top runner. Mark Chiusano padded Shore's lead by finishing 25 seconds ahead of AATC's Eduardo Matsuo. Shore's 3rd runner, Patrick Gaughan, stayed close enough to AATC's Wally Hayes to preserve the 3rd podium position. 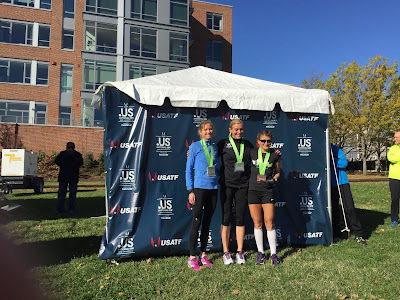 Boulder 2:20:06 (46:42),GVH 2:23:59 (48:00), Shore AC 2:25:11 (48:24). 70+: Another tight contest, Shore AC's Przemyslaw Nowicki led the team competition finishing 6 minutes in front of the Atlanta Track Club's top finisher. But all 3 of ATC's runners, Frank White, Morris Williams, and Ed Bligh finished ahead of Shore's 2nd runner, Roland Cormier. Would it be enough? Not quite as JL Seymore finished soon enough to deny ATC the gold. In teh end, Shore had a 55 second margin. The Ann Arbor Track Club had to settle for third. Their top runner, Doug Goodhue was running on a bum right leg and their 2nd runner, Monte Piliawsky, is still recovering from a hamstring injury that set his training back. Shore AC 2:56:22 (58:48), ATC 2:57:17 (59:06), AATC 3:00:36 (1:00:32).